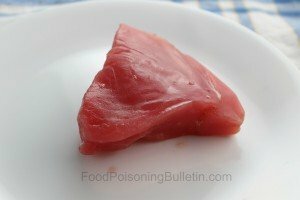 You are here: Home / Featured / How Can Sushi Tuna Be Contaminated with Salmonella? Tuna that is used for sushi is supposed to be impeccably fresh so it is safe(r) to eat. The best sushi restaurants have chefs that buy and personally inspect each piece of tuna to make sure it’s of the highest quality. The latest food poisoning outbreak in the U.S. is caused by Salmonella Bareilly, a rare strain of bacteria. Investigators are narrowing in on sushi, especially sushi made with tuna, as the cause. So how could tuna be contaminated with Salmonella? Food Poisoning Bulletin talked to Dr. Ted Johnson, professor of biology and Director of the Health Professions committee at St. Olaf College in Northfield, MN, about this issue. Dr. Johnson said that tuna does not naturally carry Salmonella, unlike chickens and cows. “The bacteria had to come from another source,” he said. He thinks that the contamination happened either in a processing facility or in containers used to transport the tuna, especially since the outbreak is so widespread. “Shipping containers are used to ship many different products. Cross-contamination could have occurred from many different food or water sources,” he added. Some news outlets have suggested that spices or sesame seeds used to produce the sushi may be the source of the contamination. Dr. Johnson doesn’t think the sesame seeds are the source, since they are roasted and their water content is low. He thinks that water has the highest probability of being the source of contamination. “It’s fairly easy to test water for bacteria,” he stated. If the contamination occurred at the processing level, that would explain why some victims ate sushi at restaurants and others purchased sushi at grocery stores. Large processing facilities ship food all around the country. One interesting note: much of the tuna used to make sushi is deep frozen because that kills parasites that could be present in the fish. But Dr. Johnson stated that “every time a meat product is frozen, it becomes a better culture for bacteria. And the more times it’s refrozen and re-thawed, the more bacteria can grow in it.” And freezing does not kill Salmonella bacteria.